Hands down the best gelato in Rome is at Della Palma. I first visited in 2005 with my friend Jenn C and make a point to go every time I'm in Rome. They have what seems to be over 100 different flavors including mousse and soy based gelatos. 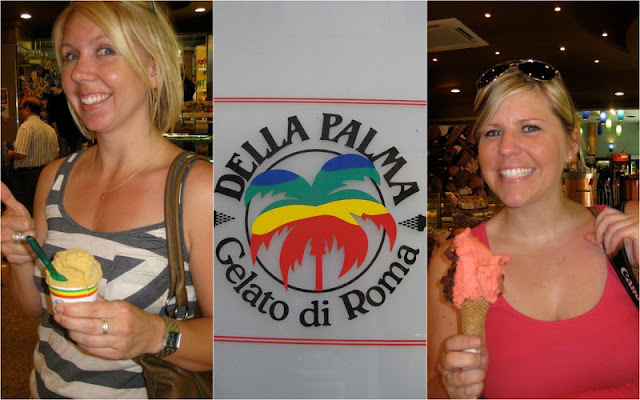 This trip we only had a day in Rome which was spent wondering the city and of course a stop at Della Palma. Don't forget to pay first! It's near the Pantheon. If you stand with your back towards the entrance of the Pantheon you will see a pathway to the left and to the right of the building directly located in front of you, walk up the left pathway, cross the road, pass the mini row of restaurants and it will be located on the left corner. Enjoy! Since when did I become Jennifer... so formal!